Freshwater biodiversity is declining, despite national and international efforts to manage and protect freshwater ecosystems. Ecosystem-based management (EBM) has been proposed as an approach that could more efficiently and adaptively balance ecological and societal needs. However, this raises the question of how social and ecological objectives can be included in an integrated management plan. Here, we present a generic model-coupling framework tailored to address this question for freshwater ecosystems, using three components: biodiversity, ecosystem services (ESS), and a spatial prioritisation that aims to balance the spatial representation of biodiversity and ESS supply and demand. We illustrate this model-coupling approach within the Danube River Basin using the spatially explicit, potential distribution of (i) 85 fish species as a surrogate for biodiversity as modelled using hierarchical Bayesian models, and (ii) four estimated ESS layers produced by the Artificial Intelligence for Ecosystem Services (ARIES) platform (with ESS supply defined as carbon storage and flood regulation, and demand specified as recreation and water use). These are then used for (iii) a joint spatial prioritisation of biodiversity and ESS employing Marxan with Zones, laying out the spatial representation of multiple management zones. Given the transboundary setting of the Danube River Basin, we also run comparative analyses including the country-level purchasing power parity (PPP)-adjusted gross domestic product (GDP) and each country’s percent cover of the total basin area as potential cost factors, illustrating a scheme for balancing the share of establishing specific zones among countries. 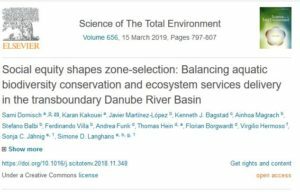 We demonstrate how emphasizing various biodiversity or ESS targets in an EBM model-coupling framework can be used to cost-effectively test various spatially explicit management options across a multi-national case study. We further discuss possible limitations, future developments, and requirements for effectively managing a balance between biodiversity and ESS supply and demand in freshwater ecosystems.